The National African-American RVers Association is trying to encourage more black people to camp and dispel the myth that "bad things happen to black people in the woods." 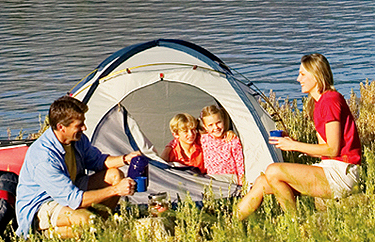 A survey estimates that out of the 30 million Americans who have camped, only 300,000 of them are black, making the nature-oriented pastime almost exclusively white. Park ranger Shelton Johnson, who is black, expresses his concern: "As the so-called browning of America goes on, if black people and other people of color aren't visiting campgrounds and parks, how is the National Park Service going to reach the public in the future?" To alleviate the problem, the National Park Service and even a few states are adopting programs to entice black people out of their homes and into the woods. But considering what used to take place in the woods (uhhh...lynching anyone?!) it doesn't surprise us that black people aren't heading to campgrounds in droves.